Same ByteBuffer can be used to read and write data. If you want to read from ByteBuffer just call the flip() method and it will convert ByteBuffer into reading mode. 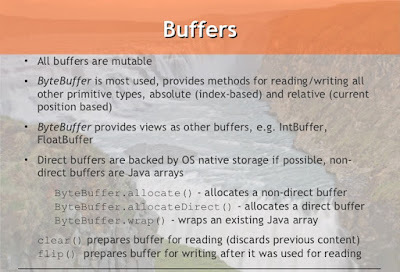 In this article, you will learn how to convert ByteBuffer to String in Java. I have a given a simple example, but if you still any doubt you can always leave a comment or question. This is one of the simplest examples to demonstrate how to convert ByteBuffer to String. In this Java program, I have first created a String literal, then I have got the byte array from that String in UTF-8 encoding scheme. After that, I have created a ByteBuffer object by using same byte array and using ByteBuffer.wrap() method. This is exactly the same situation when your ByteBuffer is filled with data whether you read it from the network or a RandomAccessFile in Java. I have just used this direct approach to create a ByteBuffer with data to simplify this example. Next part of this program is most important because there we are converting ByteBuffer to String. In order to get the byte array from ByteBuffer just call the ByteBuffer.array() method. This method will return the backed array. Now you can call the String constructor which accepts a byte array and character encoding to create String. You are done. * Java Program to convert ByteBuffer to String. * byte array to String. That's all about how to convert ByteBuffer to String in Java. Just remember to use the right character encoding because without using proper character encoding there is no guarantee that you will get original string back. Though UTF-8 is a good default it cannot be used to provide guaranteed. Indeed, I doubt if direct byte buffer return contents as array. It's better to check hasArray() before calling array() to avoid any problem, but if ByteBuffer is direct then I guess you just can't convert whole ByteBufer to String and that's not practical either. Only option would be to read String line by line or chunk by chunk I guess.